The Disney Renaissance was and still remains one of the most renowned epochs in animation. It completely renovated the antiquated reservations surrounding western animation (and, thankfully, retired the dreaded Disney Chorus) by presenting fairytales and lore as fresh, fantastically-scored stories truly suitable for the entire family. This era is a veritable treasure trove of memorable moments and catchy songs, so much so that it's nearly impossible for one's favorite film to not be from the Renaissance. It had humble beginnings, though: after a series of box office bombs almost obliterated Disney's reputation, the company recouped both its unrivaled wealth and ubiquitous media presence with 1989's The Little Mermaid. This entry, along with the regularly dismissed The Rescuers Down Under, set the stage for this proverbial "golden age" in Disney animation. While 1991's beautiful The Beauty and the Beast would never be topped, it set a precedent for the quality of films to follow and the next year's film, Aladdin, did not disappoint. The film opens with Grand Vizier of Agrabah, the brooding Jafar (Jonathon Freeman) attempting to access a Cave of Wonders in the deserts of Saudi Arabia with a golden beetle. When he is denied, Jafar and his rankled parrot companion, Iago (Gilbert Gottfried) begin their search for a person pure-hearted enough to retrieve a mythical item from the cave. Meanwhile, charming street urchin Aladdin (Scott Weinger) and his equally charming monkey Abu (Frank Welker) are trying to survive in the back alleys of Agrabah without being murdered by pursuing palace guards. While Aladdin's street smarts keep the pair alive, he longs for a life of pleasure and leisure in the palace. Across the city, Princess Jasmine (Linda Larkin) has an opposite wish: freedom from oppressive royal life, especially now that her father (Douglas Seale) is trying to marry her off. Their paths cross when Jasmine sneaks off to the market and inadvertently gets Aladdin sentenced to death after the two meet and become briefly enamored. In his shackles, Aladdin meets a disguised Jafar, who promises to reward Aladdin if he retrieves the item from the Cave of Wonders. Aladdin and Abu venture into the cave, which is stocked with untold riches and Jafar's desired object: a rusty oil lamp. When Jafar leaves Aladdin for dead, he discovers the lamp's true worth--it contains an omnipotent genie (Robin Williams) who can grant its master three wishes. With the Genie and a magic carpet on his side, Aladdin decides to wish for a royal status and untold riches so that he can woo Jasmine. However, Jafar is still pursuing the lamp and will stop at nothing to retrieve it. If the above summary seems too convoluted for a Disney film, that's because… well, it's a bit convoluted. Aladdin is based upon the legend of a poor boy discovering a lamp-bound genie that can grant him three wishes, which is a strong framework for an entertaining story. While the movie stays loyal to this basic structure, it also incorporates a wide variety of other elements: Jafar's nefarious plot, Aladdin's turmoil over lying about his identity to Jasmine, Jasmine's longing for control, Genie's wish for freedom. There's a lot going on in this film, sometimes a little too much, but it never seems to drag or bore. This was back before Disney and Pixar collaborated to write five endings for every movie and decided ninety minutes was not nearly enough time to showcase their "genius". While Aladdin might not be a structurally sound movie, it is an enjoyable watching experience. The animation makes use of an extensive color palette and seems much more vibrant than the muted Beauty and the Beast. Characters like Abu and Carpet are animated with such energy and personality that they become audience favorites after only a few minutes onscreen (particularly Abu who, despite speaking entirely in monkey gibberish, is the star of the film). Robin Williams' energetic, largely improvised voice work is complimented by Genie, whose always shifting form serves as the perfect vessel for Williams' manic delivery. It's safe to say that the Genie would not have been such a funny, memorable character without Williams' pitch-perfect comedic timing and Eric Goldberg's expressive animation. Not only is Aladdin one of the funnier Disney movies, it also has a wonderful score that doesn't confine itself to one genre like the oddly gospel Hercules or ballad-infused Tarzan. Covering every conceivable musical base, Alan Menken and Howard Ashman don't miss a beat with any of their numbers from the romantic crowd-pleasure "Whole New World" or the big-band bombshell "Prince Ali". These songs are fun and lyrically clever (with the exception of the opening number "Arabian Nights", which casts a racist shadow over the movie as a whole) and rarely slow the plot. Aladdin might not be a masterpiece on par with Beauty and the Beast or as publicly lauded as The Lion King, but it's an inarguably entertaining film that still manages to touch on some dramatic themes like freedom and loyalty to one's true identity. Even Disney cynics can find something to enjoy in this proverbial smorgasbord of a movie, whether it be Genie's snappy dialogue, Abu's impersonation of the Sultan, or Aladdin and Jasmine's love. There's no debate: Aladdin is another victory for the Disney Renaissance. Aladdin proves that one should never admit that they are a thief on Blu-ray Disc courtesy of Walt Disney Studios Home Entertainment. The film has been letterboxed at 1.85:1 and the Disc contains an AVC 1080p HD transfer which runs at an average of 30 Mbps. The picture looks fantastic, as it shows no noticeable grain and no defects from the source materials. The colors look great and the image is never overly dark or bright. The level of detail is excellent, but I never saw any issues with the animation, such as pencil marks which had been left behind. The depth is always notable. The Disc carries a DTS-HD 7.1 Master Audio track which runs at 48 kHz and an average of 5.7 Mbps. The track provides clear dialogue and sound effects. The stereo effects are good, as they alert us to sounds coming from off-screen. The surround sound and subwoofer effects really shine during the action sequences and they are especially good during the "Cave of Wonders" scene. The track really shines during the songs, as the multi-layered vocals come through very well, and we can pick out each of the distinct parts. 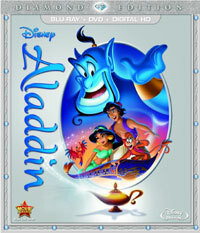 The Aladdin Blu-ray Disc is bursting with extra features, some of which are new for this release. The new offerings are kicked off by "The Genie Outtakes" (9 minutes) where Co-Directors Ron Clements and John Musker and Supervising Animator Eric Goldberg share some of the ad-libs Robin Williams supplied while recording his part. This is a nice addition, as I've often suspected by Williams, being who he was, most likely went off-script a lot while voicing Genie. "Aladdin: Creating Broadway Magic" (19 minutes) is a mini-documentary which examines the creation and inception of the Aladdin Broadway show. It includes interviews with many of the principal players from the production. "Unboxing Aladdin" (5 minutes) has Disney TV actor Joey Bragg reveals some factoids and Easter Eggs from the film. "Genie 101" (4 minutes) has Scott Weinger walking us through the many impressions which Genie does during the show. "Ron & John: You Ain't Never Had a Friend Like Me" (6 minutes) has the two directors reminiscing about their experiences working on the film, and offers some stills from the production. The remaining extra features have been carried over from previous home video releases of Aladdin and here we are treated to things like deleted songs, deleted scenes, music videos, making of, two audio commentaries, and trailers.